different. I didn’t see much ‘lady’ in Clara – except that she came from a wealthy family and wore beautiful gowns. She was quite outspoken – being a journalist, and – of age or not – downright disrespectful to her father. Daniel’s hatred and anger screams across the pages and makes it very hard to like him, even knowing the reason behind his bitterness. And then there’s the opium storyline…what?! I couldn’t understand why it was included, and yet it was the main focus for the climax. I never understood what the Professor wanted from Daniel (or who the Professor actually was)? I’m glad Bane was able to escape, but, again…I just couldn’t connect what the cronies of the drug underworld had to do with Clara or Daniel? That part was all just…um…icky. I just didn’t like it. 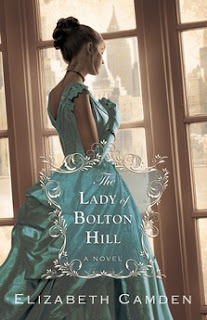 Pretty cover, but The Lady of Bolton Hill had too many conflicting, disagreeable characters and subjects that did not meld into a seamless, enjoyable story for me. Thank you to Elizabeth, through Jim Hart and Bethany House Book Reviewers, for sending me a copy to read and review!